We've finally hit 300 ink reviews! #300 is Krishna Jungle Volcano. Thank you to Ink Journal for sending over a sample for review. I tried some of the early versions of Krishna inks, and noticed some issues so I'm hoping this new Krishna ink performs better. Jungle Volcano is a dark orange with bright green sheen. In large swabs there is some bright green sheen. Other properties: no shading, high sheen, and no shimmer. If there is any shading, it is hidden under all of the bright sheen. There is a lot of sheen, it's not quite monster sheen territory, but it's close. On 20 pound copy paper the ink was prone to smearing. 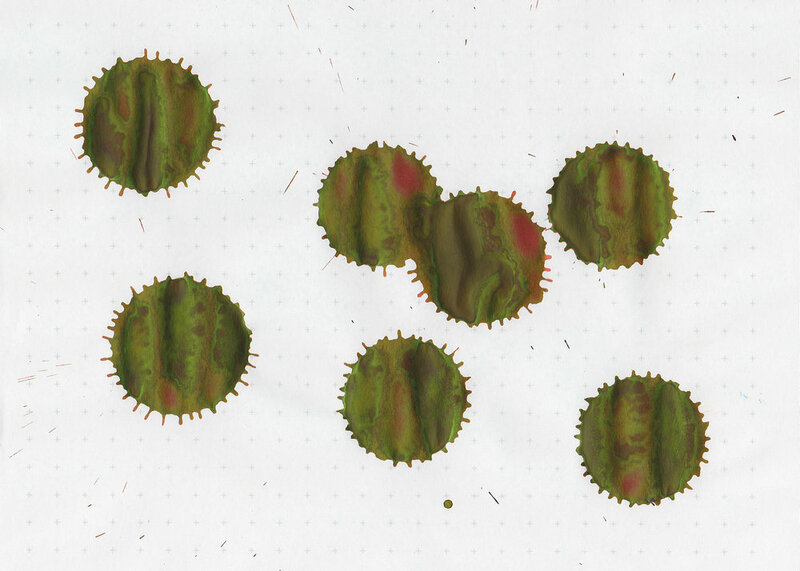 Ink swabs for comparison, left to right (top to bottom for mobile RSS): Montblanc Lucky Orange, Krishna Jungle Volcano, and Robert Oster Orange Zest. Click here to see the Krishna inks together. Diamine Blood Orange, Papier Plume Heart of Gold, and Diamine Pumpkin. Click here to see the orange inks together. I used a broad Pelikan M805 Vibrant Blue on Tomoe River paper. The ink had a slightly sticky flow. There was a little bit of nib creep. Overall, I like this ink more than the other Krishna inks I've tried in the past, and will be adding more of the new colors to my wish list. It is slightly sticky due to the high saturation of the ink, and it is a bit hard to clean out. 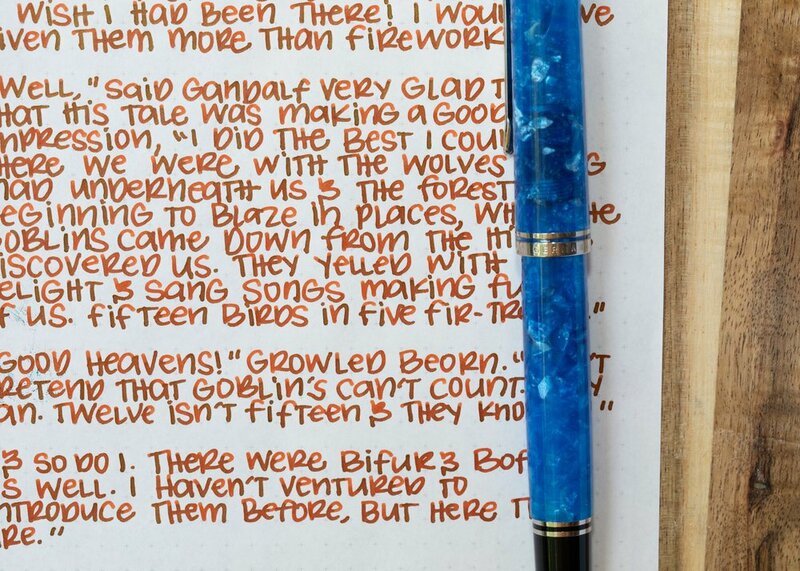 This is the first high sheening orange ink I've seen, so it's a unique color. Disclaimer: A sample of this ink was provided by Ink Journal for the purpose of this review. All photos and opinions are my own. There are no affiliate links on this page.